Line a large tray or baking sheet with parchment paper. Set aside. In a medium bowl, mix shredded coconut, panko, lime zest and salt. In a separate bowl, whisk egg. Place shrimp, one at a time in beaten egg coating evenly then transfer to panko mixture, turn to coat. Place panko coated shrimp on parchment paper lined tray. In a large skillet, over medium heat, pour enough oil to reach depth of 1/8-inch. Add shrimp in small batches and cook until golden; approximately 2 minutes on each side. Transfer fried shrimp to a paper towel lined plate. Serve with mango dipping sauce. Mango sauce: In a small bowl, place mango pieces and mash with potato masher until smooth. Add honey, lemon juice and hot sauce and stir to combine. Serve in dipping bowl and garnish with Serrano pepper pieces. If you prefer the dipping sauce less chunky, blend all sauce ingredients in a food processor, serve and garnish with Serrano pepper pieces. Whenever we go on a road trip up the California coast, we make it a point to stop at our favorite Malibu restaurant featuring coconut shrimp. It’s been a while since we’ve stopped by so I decided to satisfy my coconut shrimp craving and prepare it at home. The preparation is very simple and quick. 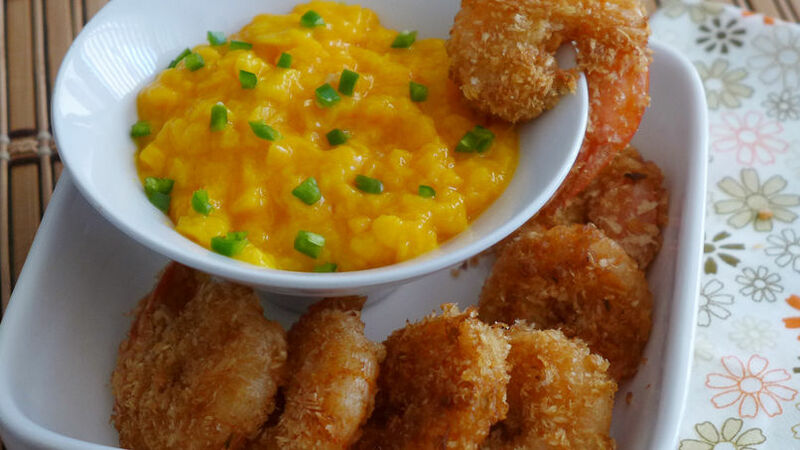 Bits of golden, unsweetened coconut flakes and panko crumbs give each shrimp piece that perfect bite when dipped into this spicy honey-mango sauce. Enjoy!